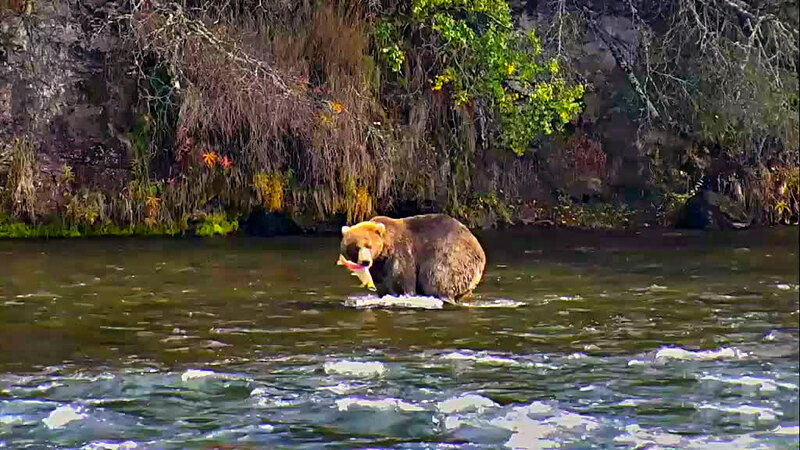 As you’ve likely noticed a few bears are fishing at Brooks Falls in September. I haven’t spent much time at the falls this month, so I have a limited set of observations to base my information on, but the bears at the falls seem to be catching “fresher” fish. Another way to state this is that the salmon 480 Otis or 814 Lurch catches at Brooks Falls may not be spawned out. Take a look at the photos below and compare a fish that Otis caught in the jacuzzi last week (first photo) to a fish that was caught by 410 in the lower Brooks River (second photo). Otis’ fish is bright and not worn in appearance. In contrast, 410’s fish has a ragged tail fin and other signs of wear. It doesn’t seem like the bears at the falls can catch enough fish to keep them satiated so we’ll see them wander downriver daily, but if you can catch a fresher sockeye or silver salmon, then it may be worth the time spent at Brooks Falls.